Myaudittsucks.com - The Better Business Bureaus tries to cover their buts! Do Not File A Case With the Better Business Bureaus. The Better Business Bureaus job is to help business succeed, not to protect the consumer. Just like the Texas dot hearing, your invoices repairs will be overlooked. Its like you never took the car in for repairs. looked away. The BBB employees had no idea that the VW and the Audi TT is basely the same car. After the Better Business Bureaus dismiss my case and said the car was not a lemon. I sent the BBB a freedom of information letter to see the number of complaint they have against Audi and VW. This is the letter I got back! Below is the contact information to the Better Business Bureaus hearing and some of their emails. Better Business Bureaus covering their buts! Now they are having a recall that validates what my case was about. What is the BBB going to do know? disbelief that the arbitrator failed to agree with their position. all parties, but that is not possible given the nature of the process. you still have recourse through their program to resolve your concerns. Again, I regret we failed to meet your expectations. Cc: webmaster@ftc.gov - federal trade commission. You said I rejected the repair decision on your case. That's incorrect. Audi said there was noting wrong but they would look at the car again. They didn't say what they would repair. Did you catch that? So what would I take the Audi TT in to be repaired for? I already took the car in 7 times for 9 different problems. The main problem was for the engine cutting out. Serious safety hazard! My Audi TT passed the entire BBB lemon test. It sound like the BBB would have me taking the car in forever. Anyway, two years latter Audi and VW have a recall and you say. another party that is not pleased by the outcome. I can't believe you said the BBB just looked at the facts. The Audi TT had a ton of invoice and the paper work was in the arbitrator face. The invoice shows that Audi tried to fix it seven times. At my hearing one of the BBB employees setting in on the hearing told the Audi rep that the BBB gets a high number of VW lemon. This tells me that the BBB new about the Audi TT problems. 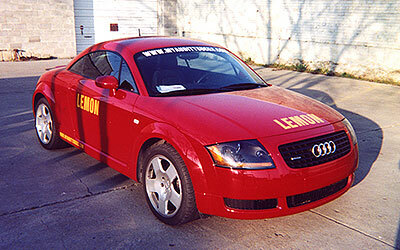 Just a little reminder of what BBB lemon test my Audi TT passed? 1. Serious safety hazard is defined as a life-threatening malfunction or nonconformity that substantially impedes a person's ability to control or operate a motor. 2. Impairment of market value is defined as a substantial loss in market value caused by a defect specific to the motor vehicle. 3. The same nonconformity has been subject to repair four. 4. Two of the repair attempts must be made within a period of 12 months. 5. 12,000 miles, whichever occurs first. 6. Two other repair attempts must be made within 12 months or 12,000 miles, whichever occurs first. 7. Creates a serious safety hazard and has caused the vehicle to have been subject to repair two or more times. 8. At least one attempt to repair must be made in the period of 12 months or 12,000 miles, whichever occurs first, and at least one other attempt must be made in the period of 12 months or 12,000 miles. 11. The vehicle is out of service for repair for a cumulative total of 30 or more days in the 12. 24 months or 24,000 miles, whichever occurs first. 13. At least two repair attempts must be made in the first 12 months or 12,000 miles immediately following the date of original delivery to a consumer. Arbitrator's Occupation: Manage all legal services relating to commercial transactions real estate.